The Small Mambe Hooded Blanket / Sideline Cape keeps you warm and dry in the coldest conditions. It is a cross between a full length jacket and a warm blanket. The outer shell is completely waterproof and windproof, and the lining is made with genuine 300 weight Polartec fleece, the industry standard for thermal fleece. An integrated heat reflective lining adds further warmth by reflecting and retaining radiant body heat. The hood and internal pockets are also lined with fleece for extra warmth. 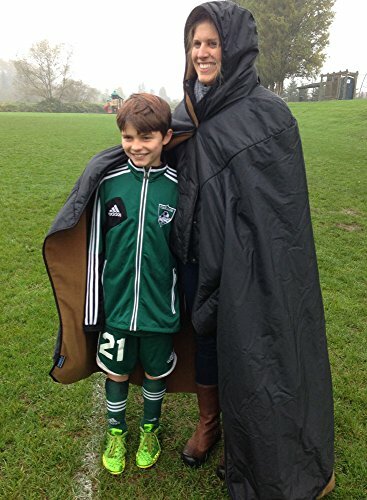 The Mambe Hooded Blanket is an amazing and effective alternative to a basic stadium blanket or traditional coats. Ideal for sports, camping, etc. Small size is perfect for anyone 5'2" and under. Outer shell is black; interior fleece is Black. Stuff sack included for convenient storage and transport. Machine washable (cold/warm water, low heat). Proudly made in the USA! 100% WATERPROOF/WINDPROOF. An amazingly effective alternative to a basic stadium blanket. Genuine Polartec® Classic 300 fleece - thick, WARM, and soft. The highest quality fleece made. Radiant Heat Reflective Lining for retaining body heat. Fleece lined hood and pockets help you stay warm in even the coldest conditions. Youth/Petite size is perfect for most people up to 5'2". Also available in Regular and XL sizes. Stuff sack included for convenient storage and transport. PROUDLY MADE IN THE USA and guaranteed for life. If you have any questions about this product by Mambe Blanket Company, contact us by completing and submitting the form below. If you are looking for a specif part number, please include it with your message.